We found this recipe on Rasa Malaysia. 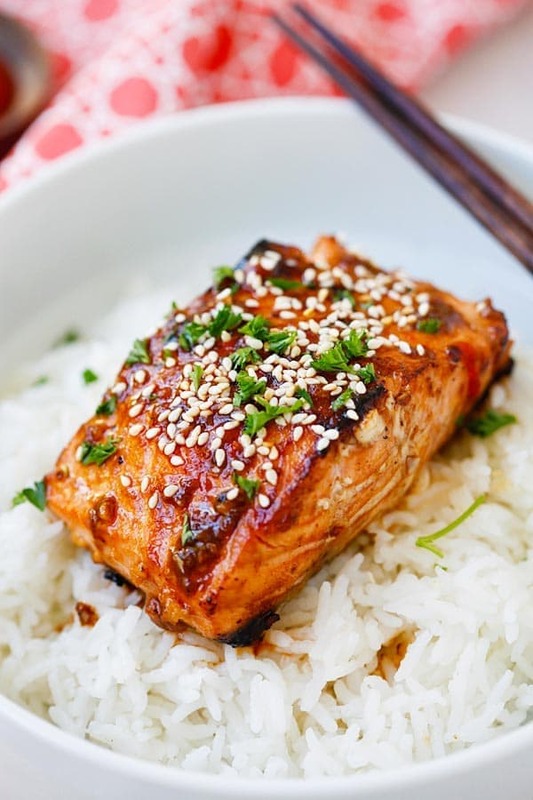 "Sweet & Spicy Sriracha-glazed Salmon in the Skinnytaste cookbook. Moist, juicy, and so yummy." In a 1-gallon zip-top plastic bag, combine the soy sauce, honey, vinegar, Sriracha, ginger, and garlic. Add the salmon, toss to coat evenly, and refrigerate for at least 1 hour, or up to 8 hours, turning the fish once. Remove the salmon from the bag, reserving the marinade. Heat a large saute pan over medium-high heat ad add the sesame oil. Rotate the pan to coat the bottom evenly and add the salmon. Cook until one side of the fish is browned, about 2 minutes. Flip the salmon and cook until the other side browns, 2 more minutes. Reduce the heat to low and pour in the reserved marinade. Cover and cook until the fish is cooked through, 4-5 minutes. Place a piece of salmon on each of 4 serving plates and sprinkle with the scallions.